Living and practicing Chinese medicine in the central California foothills allows me a first-hand look the seasonal/environmental changes that directly influence our horses’ health as well as our own. Learning to read the local seasons has deepened my appreciation for the ancient practitioners of Traditional Chinese Medicine (TCM) and their keen observations of the natural world. They observed that the season and environment directly affect the various systems of the body and that seasonal shifts leave the body more vulnerable to external factors like cold, mold, dampness and dryness. As the year gradually moves from yang to yin and passes through the five elemental phases/seasons, allergies (seasonal/elemental sensitivities) accompany those shifts. 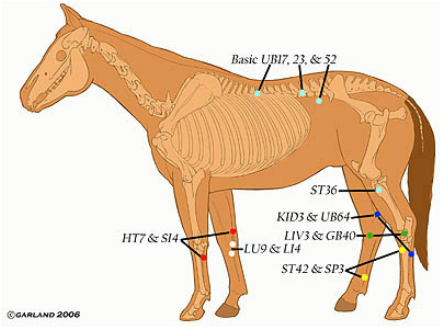 Understanding these shifts and what they represent can help us manage and cope with equine allergies. The Chinese observe five seasons, including late summer. Each element corresponds with a season: wood/spring, fire/summer, earth /late summer, metal /autumn and water /winter. Additionally, each season has a corresponding organ/meridian system. For example, autumn is the season of metal. The lungs and respiratory system, which are associated with the metal element, are more vulnerable during this time. I know that in the dryness of autumn, after the full baking heat of the California summer, I will be filling herbal prescriptions for all types of respiratory related conditions - from dry coughs and runny noses to seasonal heaves. Typical of seasonal-related problems I see in my practice would be an older appaloosa gelding whose uveitis flares up in the spring (wood is associated with the eyes) when the cottonwood tress in his pasture are budding out, a filly that starts wheezing and develops a clear nasal discharge in the dusty autumn (metal - lungs) and a mare that develops itchy skin in the height of summer (fire - blood). All are examples of a seasonal element under stress manifesting as a sensitivity, reaction or allergy. We can expect to see allergic responses when the seasons shift. Unfortunately, most of us call for help only after our horse is in acute distress with full-blown symptoms; western methods of treatment as well focus more on treatment of disease symptoms. By contrast, key emphases of Traditional Chinese Medicine are prevention and strategies for maintaining wellness. If we can learn to watch for seasonal changes and train ourselves to think ahead, we can help our horses avoid or reduce seasonal allergies. Ideally, I like my patients to act ahead in anticipation of allergy season. I consider this a preemptive, wellness intervention. In other words, in advance of allergy season, start a prevention program well before the symptoms become an issue. In Traditional Chinese Medicine, disease prevention begins with a protective layer around the exterior of the body called wei qi or defensive energy. Wei qi is the body's initial protection against external allergens or pathogens. From a western perspective, wei qi can be compared to immunity. When wei qi is strong, irritants and allergens are deflected away from the body; when it is weak, as in the cases of the horses mentioned above, a variety of problems can occur. A simple herbal strategy especially useful for preventing and lessening respiratory allergies is the formula Jade Wind Screen, containing the herbsHuang qi (Astragalus), Fang feng (Saposhnikovia) and Bai zhu (Atractylodes). 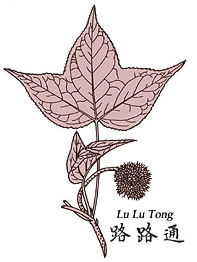 Additionally, the herb Lu Lu Tong (liquidambararis) is classified as having anti-allergy qualities is excellent for both respiratory and skin allergies commonly seen in horses. If you look closely at the seedpod of the liquidambar tree, or Lu Lu Tong, it actually resembles an enormous grain of pollen. Acupressure massage to the following basic points (shown in light blue) combined with the seasonal points shown in their traditional elemental colors is helpful in the boosting the body’s natural defensive qi and ability to tolerate the presence of irritating allergens. By using our own observations of our local natural environments and the wisdom of TCM, we can help our horses maintain year-round wellness.